I'm not a cell phone owner like most people (I've tried to avoid it as long as I can), but I was thinking certain ring tones might be inappropriate if the phone rings at the wrong time. I'm not talking about just ringing at a bad time, but more like, picking a tone with lyrics in it like "i like big butts" when passing by a Layne Bryant store. Though, who knows, if you picked that tone maybe that's a good thing. Aerosmith's, "Dude (Looks Like A Lady)"
Your phone going off during a conversation with an androgynous-looking man would make for awkwardness. 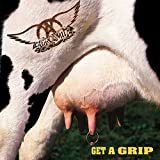 Aerosmith's, "Janie's Got A Gun"
If the phone goes off in class and there is a girl named Janie in the class room, everybody might think that she brought a weapon to school.